One of the surprising things I learned when I started side hustling was that doing so gave me access to an extra retirement account unique to side hustlers. This was true even for sharing economy/gig economy side hustles like Uber or Postmates. 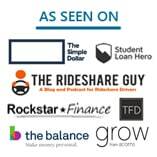 Most people don’t realize it, but when you’re working in the sharing economy/gig economy, you’re technically a self-employed business owner. Your business is you and you’re the boss and sole employee. And as a benefit, when you’re self-employed, you get to contribute to self-employed retirement plans like a Solo 401k. Yes, even a lowly delivery person can put away money in the same manner as a successful solo entrepreneur. Last year, I set up my Solo 401k with Fidelity and this past week, I made my first contribution to it. At first glance, the process seemed pretty intimidating, but it actually turned out to be much easier than I expected. 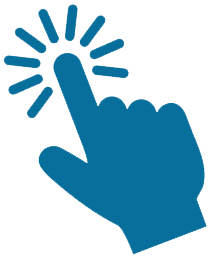 This post walks you through the entire process of setting up and contributing to your Solo 401k. Just a quick note. I opted to go with Fidelity when I set up my Solo 401k because it’s free to set up and has no annual fees. 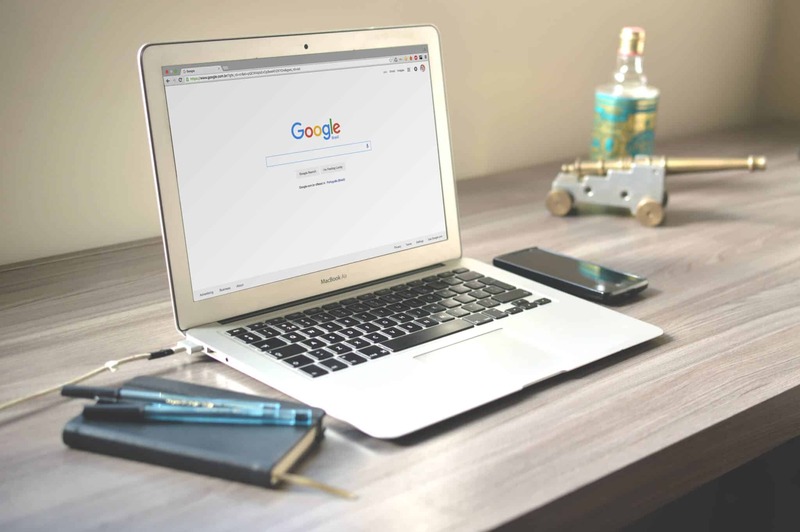 I would imagine that the process for contributing to a Solo 401k would be pretty much the same with any company, but be aware that this post is geared specifically towards those of you looking to contribute to a Fidelity Solo 401k. A Solo 401k is a retirement account that is available to any independent contractor. Basically, any money that you have to pay self-employment taxes on can be contributed to a Solo 401k. In terms of how it works, it’s pretty similar to your 401k at work except that you are in charge of it. Remember, as an independent contractor, you’re basically a business of one. You’ve got one boss (you) and one employee (you). The Solo 401k is like your business’s own little retirement plan. 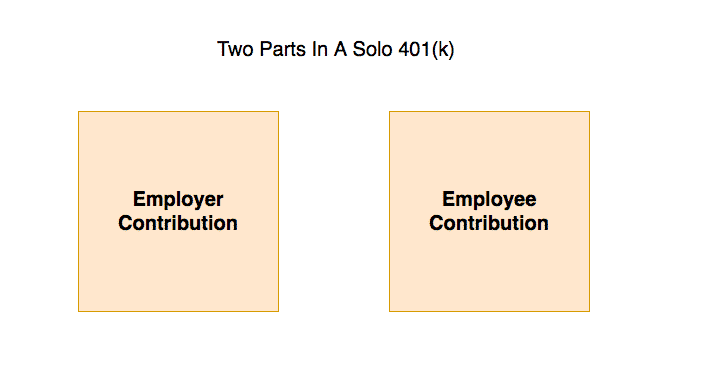 There are two parts to the Solo 401k: the employer part and the employee part. Just like with your 401k at work, you can contribute money to it as an employee. Nothing too complicated there. In addition, since you’re also technically the employer, you can also make an employer contribution to the plan. Think of it like the match you might get at work. Your Solo 401k has two parts to it – an employer contribution part and an employee contribution part. Which Solo 401k Provider Should You Use? There are a ton of Solo 401k options out there, but in my opinion, Fidelity is the optimal choice for the side hustlers out there. The reason I like Fidelity is that it’s free to set up and has no annual fees. In addition, trading fees are also non-existent if you’re an index investor like myself. They don’t charge any trading fees if you’re buying and selling Fidelity funds and it’s easy enough to find a Fidelity fund with really low expense ratios. Fidelity is my preferred choice because it costs nothing to set up or maintain. And it costs nothing to buy or sell if you’re using Fidelity funds. So why would I pick Fidelity and not a company like Vanguard? As much as I love Vanguard, their Solo 401k isn’t quite as good an option because it comes with an annual fee of $20 per year for every Vanguard fund you hold. This fee is waived if you happen to have more than $50,000 in the account. The $20 fee isn’t terrible if you’re just picking one fund, but why even pay the fee at all if you can get the exact same thing for free, right? This is extremely important if you’re looking to tax-shelter some of your independent contractor income. The deadline to set up your Solo 401k is December 31st. This is a little different from other plans where the deadline to set up your account is the tax filing deadline. I didn’t realize this myself, and as a result, I missed out on a bunch of tax savings for 2015. Note that you can contribute to your Solo 401k all the way up through your tax filing deadline. It’s just that the actual account has to be set up by the end of the previous calendar year. In order to contribute to a Solo 401k, you need to first get an Employee Identification Number (“EIN”) from the IRS. 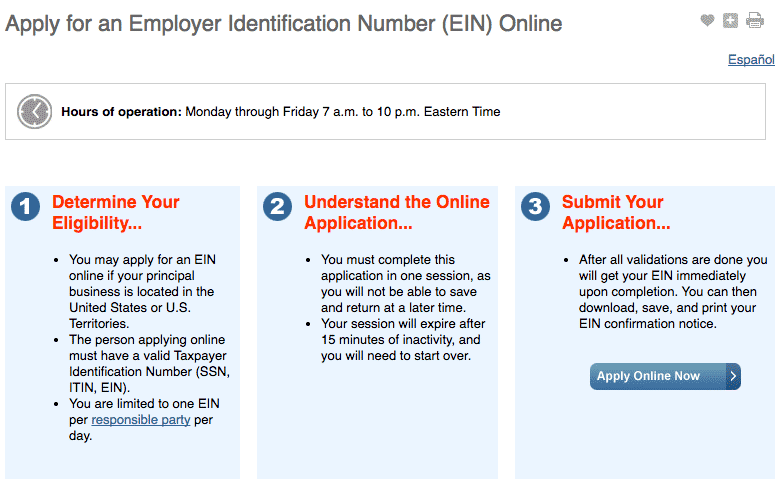 The EIN is basically like a social security number for your business. It’s easy enough to get yourself an EIN. All you need to do is apply for one at the IRS website here. The entire process is super simple. Just follow the directions on the website. It only takes a few minutes and you’ll get your EIN immediately. When you get your EIN, make sure you print out the page and save the number somewhere. I’m sure you can get your number again if you lose it, but it’s probably better not to take that chance. You’ll need to fill out two forms in order to set up your Fidelity Solo 401k. 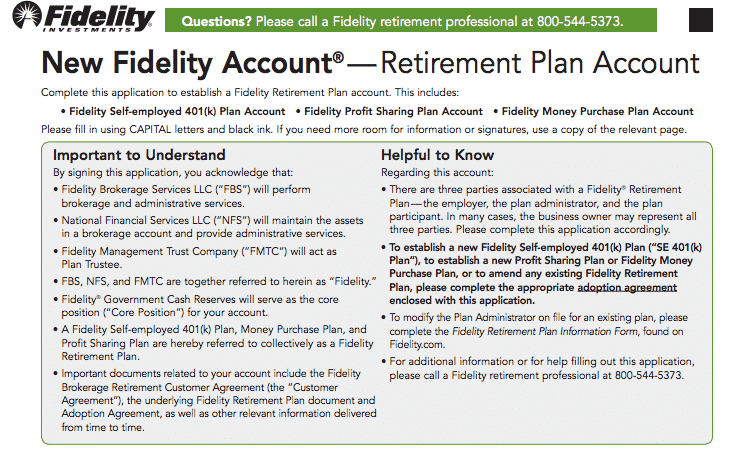 Both forms are pretty straightforward and can be found on Fidelity’s website here. Just go the “Get Started On Your Own” section of the website to download the forms. Things to remember with the application are that you are the plan administrator and the sole employee. You also don’t need to fund the account right away. It’s easiest to just get the account open first. 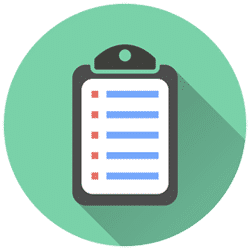 The second form you need to fill out is the Adoption Agreement. Like with the application, remember that you are the employer and the sole employee. If you have any questions, just call up Fidelity and they’ll walk you through the forms. They’re actually pretty helpful over there. Once you’ve got both forms completed, just mail them to Fidelity as instructed. Your account should be opened up in just a few days. Once you’ve got your account opened, the next step is to actually put money into the account. The weird thing about Fidelity is that they don’t let you contribute to your Solo 401k online. Instead, you have to mail them a check. Kind of annoying, but not all that big a deal. I wrote a check from my regular bank account and then mailed it off to them in a regular envelope. When you mail your check, make sure to also include the Contribution Remittance Form, as seen below. You should also put your account number in the memo field of your check. Note that you do not need to pick any specific funds when you’re making your contribution. Instead, your contribution will default to a basic money market holding account. You can then pick your funds online once the money is in your account. One nice thing is that the contribution process is really fast. I mailed my check to Fidelity on April 10th and my funds were in my account by April 13th. When you’re making your contribution, make sure that you’re aware of what your contribution limits are. As of 2017, your employee contributions are limited to $18,000 across all of your 401k accounts. Your employer contributions are limited to 20% of your profits after deducting 1/2 of your self-employment taxes. Stay tuned for a future post explaining these limits some more. Now that you’ve put money into your Solo 401k, the next step is to get that money to work. Your options might differ depending on how much you have in your account. No matter what though, you’re going to want to look for Fidelity Index Funds with low fees. Luckily for us, Fidelity has a ton of good options out there that are pretty much the same as those offered by Vanguard. iShares Core S&P Total US Stock Market ETF (ITOT) (Expense Ratio = 0.03%). These options are exactly the same as the Vanguard Total Market Index Funds that we all love! I personally put my contributions into FSTVX. A 0.09% expense ratio is basically the lowest you can get and I get plenty of diversification by tracking the entire US market. Once I have more money in my Solo 401k, I’ll likely switch it over to FSTMX. If I didn’t have enough to meet the fund minimums, I’d buy ITOT. The last thing we need to do is to make sure we’re recording our contribution so that we can get our tax deduction. If you’re using Turbotax or some other tax preparation software, it’ll take care of that for you. If you’re doing your taxes by hand, just go to line 28 on your Form 1040 and enter in what you contributed for the year. That’s it! Please be aware that I am not a tax expert by any means, so make sure you consult with a tax professional as needed. How Much In Taxes Did I Save? Setting up the Solo 401k is a pretty big benefit given my working situation. For some reason, my job only gives us access to a 457 plan, and as a result, I don’t have a 401k plan at work. The good thing, though, is that contributions to a 457 plan don’t count towards my 401k contribution limit. As a result, I’m basically able to create my own 401k and put almost all of my side hustle income in it. That results in huge tax savings for me! So how much did I save in taxes this year? I managed to contribute $5,620 into my Solo 401k last year. That money would have been taxed at the 25% tax bracket. I always consider side hustle income to be taxed at my highest marginal tax rate since it’s technically money that I otherwise wouldn’t have earned. Not too bad at all. That’s almost $2,000 in tax savings for the year. And this is money that can now grow tax-free in my bonus retirement account that regular people don’t get to have! Are any of you side hustlers taking advantage of the Solo 401k or other self-employed retirement plans? Great post! I find all of your posts very helpful. Can’t wait to read more about Solo 401k’s. Could you use the taxable income you get from your side hustle to allow you to open up a Roth as well? Curious since I am only a college student so that could be helpful. And if I understood it correctly, with a Solo 401k you can contribute ALL of your earnings up to 18k and then on top of that 20% of the profits after 1/2 of the employment tax correct? So you can contribute more than you made if you make less than $18k/year? Thanks for sharing that! I think I’m going to have another post to try to explain the limits some more. It took me a while to understand, but I’ve totally got it figured out now. I would love to read this post! If you’re talking about opening up a Roth IRA, then yep, you can definitely just open up a Roth and put your income in there. That’s useful if you’re in college and probably paying no taxes anyway. Fidelity actually doesn’t have a Roth 401k option, so you’d have to look at a different provider, such as Vanguard, Charles Schwab for that. As to the second part, it’s a little bit more complicated. You can put all of your earnings up to $18k as an employee contribution. Just remember, it’s post-deduction income, so you need to first figure out what you made minus all deductions. Then you also have to subtract half of your self-employment taxes, since that also counts as a deduction from your operating income. The formula to figure out your income is the following: First, do all your deductions (i.e. whatever expenses you incurred that you can deduct). That’s your operating revenue. Then, you multiply that number with (92.35% x 15.3% x 50%). That’ll give you 1/2 of your self-employment taxes. Subtract that number from your revenue to get your total revenue minus all deductions. That’ll be the amount you can contribute as an employee contribution, assuming it’s less than $18k. If it’s more than $18k, then you’ll be able to contribute up to $18k. A simple example will help clarify. Let’s say you made $5,000 in 1099 income after expenses. You can’t just put $5,000 in as an employee contribution because your net operating revenue is actually a little less because of the expenses from self-employment taxes. To figure out what you actually made, you do the following. So, first, you multiply $5,000 x (92.35% x. 15.3% x 50%) = $353.23. Then $5000 – $353.23 = $4,646. That’s the amount you can contribute as your employee contribution. You can’t put anything else as your employer contribution in that case if you already put in all of your income as an employee contribution. In other words, you can’t put in “more” than you actually made. I know, seems super complicated, but I can definitely try to explain it better in another post. Hope that helps a bit though. Let me know if you have any questions. Awesome post! I actually just turned in my paperwork for a solo 401k – also at Fidelity! I wish this post had gone live a few weeks earlier! Oh bummer, but cool that you just set up your Solo 401k! Let me know how it goes! Thanks for sharing this info! My husband doesn’t have access to a 401k so I was hoping to leverage my blogging income to help him contribute the 18k to a 401k. Did you see any research about how to set up this situation that you could point me to? Assuming we can’t go the solo 401(k) route since I would technically have one employee. This might get tricky because then I’ll need to file as something other than a sole proprietor? Hey J. Sorry for the delay in responding. I’m getting married in 3 days and needless to say, it’s a busy time! So, I’m not an expert on this, but you can actually hire your spouse and still keep the Solo 401k. I’m not sure of any resources and this might be a topic for a post one day when I can actually do some research, but I’m pretty sure that having a spouse as an employee does not mess up your ability to do a Solo 401k. Nice write up, FP! I max out my employer 401(k) so I don’t think I can contribute any money to a solo 401(k)? I’m looking forward on your write up for the employer contribution piece. You could still put 20% of your operating revenue as an “employer” contribution. It’s basically like you’re giving yourself a match! It won’t be as much obviously, but it’s something. Can you open a solo 401(k) if you have a 403b at work? You definitely can. All you need to remember is that the $18,000 limit that applies to your 403b contributions applies across all of your 401ks and 403bs. In other words, if you are already maxing out your 403b at work, you can’t make any “employee” contributions to your Solo 401k. You’ll only be able to make “employer” contributions to your solo 401k, which is basically about 20% of your net revenue. Thanks for this! Something tells me I’m gonna need this info in the future so gotta pin this!! Hey Brooke. You just use your SSN when signing up for Postmates and other gig economy apps. You only need the EIN for the Solo 401k setup. Do you fund your Solo 401K from your personal or business bank account (I’m assuming you’re a sole prop)? I just fund it from my personal bank account. It doesn’t matter where the funds come from, so long as you have the right amount of self-employed income to make your contribution. Fidelity is weird in that they don’t do electronic transfers for your Solo 401k, so you literally just have to handwrite a check to them to put the money into your account. I use my banks check writing feature and have them mail the check for me. Ah the check-writing feature! That’s so smart. Is this Ally? It’s actually just a normal brick and mortar bank, but you can use Ally, Capital One 360, Simple, or anything else that suits your fancy! Just to ensure that I understand it correctly, since my employer doesn’t provide 401K (since I am a contractor), I can utilize solo 401K. So if I were to then switch job to one that provides 401K, I can still contribute to my solo 401K through the “employer” portion? Yes, if you’re a 1099 contractor, you can create and use a Solo 401k – you’re a business of you, so you’re both the employee and the employer. You can only contribute to your Solo 401k based on your 1099 income. So whatever you earn from a regular day-job, you can’t put into a Solo 401k. Thanks so much. But actually, I am on W2 with the company but they don’t offer 401K benefit. Will I still be able to contribute to the solo 401K? Unfortunately, no. The Solo 401k is a self-employed retirement plan, so it requires you to earn self-employed income. You’ll have to use something like an IRA or Roth IRA instead. Ah, good question, and I’m actually not 100% sure. I think you would open it up in the name of the LLC. If you call Fidelity, I’m sure they’ll walk you through it. LLC itself is basically the same as a sole prop, just with the legal protections of the LLC, so my guess is that it’s exactly the same process as opening up a Solo 401k for a sole prop biz. Shouldn’t you use the effective tax rate rather than the marginal tax rate? Those are very different amounts. If your effective tax rate is 25% , well that’s just great. I use marginal tax rate when I think about side hustle income because that is money that I otherwise wouldn’t have earned and is technically the last dollar I earn. So, if I earn 50k in a day job, my choice to side hustle is exactly that, a choice. I don’t “need” to side hustle. As a result, every dollar I earn extra I consider it to be taxed at the effective tax rate. That’s just my way of thinking since I could have opted not to earn that money at all since I don’t need it. I do not have/use an EIN. I am set up as a sole proprietor with SS# only and file taxes as self-employed contractor under SS#. Can I set up and contribute to a Solo 401k with SS# or would I have to get an EIN. You don’t need an EIN to do your taxes as a sole prop, but I believe you do need an EIN to open a Solo 401k with Fidelity. It doesn’t impact your taxes or anything to get an EIN.